Updated at 6:57 p.m. ET: A Louisiana father-and-son team is being credited with rescuing dozens of people in the low-lying Plaquemines Parish on Wednesday as Isaac made its way inland from the Gulf of Mexico. “There was a family of five on a trailer with about one foot left before they were to go under, and they were screaming away,” Jesse Shaffer Jr. of Braithwaite told MSNBC's Tamron Hall. “I’ve seen about 60 rescues today and that’s including about 30 animals,” he said. Across the Gulf Coast, residents abandoned their homes, with some heading to evacuation centers to ride out the storm. Others weren't as fortunate. The cyclone, downgraded to a tropical storm Wednesday afternoon, threatened to flood towns in Louisiana and Mississippi with more rain and storm surges. Plaquemines Parish President Billy Nungesser said about 2,000 residents were ordered to evacuate, but only half left before Isaac made landfall late Tuesday. 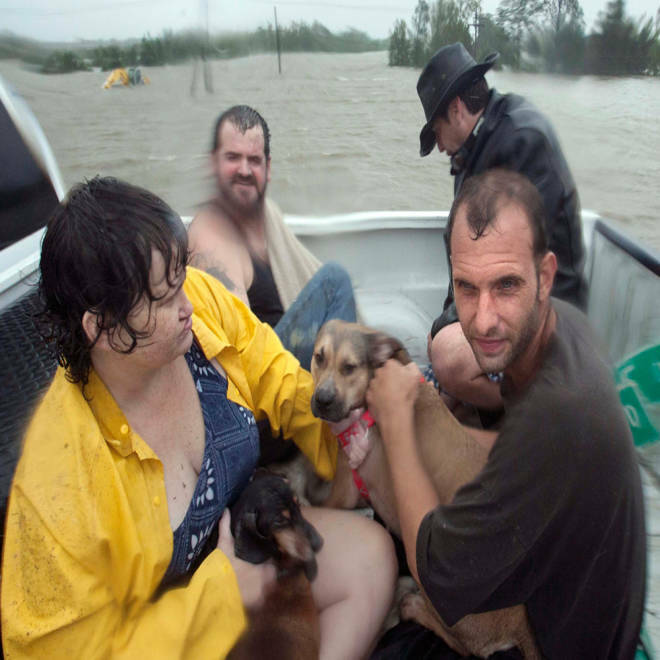 At least 118 people were rescued in Plaquemines, including 25 trapped on their roofs, authorities said. Shaffer was among a tireless crew to save several residents in the east bank, Nungesser told The Times-Picayune in New Orleans. Levees in the east bank are just over 8 feet high, while storm surges have been estimated as high as 14 feet. The Mississippi River cuts the parish in two as it flows to the Gulf of Mexico. One rescue included a woman and her 5-month-old baby, both plucked from a rooftop, Nungesser said. Shaffer, 25, his 53-year-old father, Jesse Shaffer Sr., and two other men headed out on boats to reach residents trapped or stranded by the rising water, The Times-Picayune reported. “I was watching the water all day yesterday and then we got the surge around 1 and 1:30 last night,” the younger Shaffer told MSNBC. He launched his boat from a service road and headed into this submerged community before dawn. Joshua Brockhaus, an electrician who lives in the flooded area between New Orleans and the Gulf of Mexico, also helped rescue neighbors in his boat. "I'm getting text messages from all over asking for help," Brockhaus told the AP. "I'm dropping my dogs off, and I'm going back out there." In Houma, La., Doug Bourg was busy making sure families streaming into the Houma Municipal Auditorium, the official evacuation center for Terrebonne Parish, had the latest information on Isaac. “At the moment, we have 194 people here at the center,” Bourg told NBC News. Bourg, an administrative assistant to the Terrebonne Parish president, said each family was advised to bring enough food for at least 72 hours. Dominica Knight, a 23-year-old mother of two, spent the evening at the center. "I have kids and they both have asthma," she told The Associated Press, as she held her 11-month-old baby in one arm while holding onto her 2-year-old with her free hand. She said she didn't want to be without electricity or away from emergency assistance with Isaac near. “I'm not used to evacuating," she told the AP. Faced with pelting rain, winds and rising water, Lafitte Mayor Tim Kerner led a sandbagging effort in his community to build a last-minute extra line of defense, he told the Times-Picayune. Members of the National Guard were expected to assist in the effort. Seven years ago, when Hurricane Katrina bore down on New Orleans, former Audubon Zoo worker Dan Maloney was sleeping next to the reptile house, First Coast News reported. Creepy perhaps, but it was the highest ground in the zoo. He and a staff of 15 zookeepers ended up living at the zoo for two months, caring for the animals even as food supplies dwindled. Ultimately, he is proud of saying, only four animals died. Two were otters, the BBC reported at the time; an alligator also escaped, although at the time Maloney was confident the alligator would return. As Hurricane Isaac ripped through the city on the seventh anniversary of Katrina, Maloney, who now works at the Jacksonville Zoo and Gardens in Mississippi, hoped for the best and recalled, with some fondness, earlier efforts. The zoo employees organized armed patrols, First Coast News reported, and built their own shower. Hurricane Isaac held Floridian Ismay Williams captive in her own home – not because of flooding or power outages but because it moved a small colony of bees into her home. "I have intimidating problems with them. I'm scared they will sting you," Williams told NBC-2 in southwest Florida. "I wouldn't want 60,000 bees to get angry with me." And so Keith Councell, a homegrown bee keeper from the area, checked out her home. He sealed a hole the bees were using as an entryway, making sure they could only exit. In Cape Coral, Fla., Richard Chapelle found 10,000 honeybees lounging on the grass in his backyard, brought there, apparently, by wind and rain from the storm.